Coffee is something that everyone enjoys. It is the second most consumed beverage in the world and all avid coffee drinkers wish if they could be as talented as the barista in their favourite coffee shop brewing lip smacking coffee. If you are sharing this dream yourself, you should also know that if you are aspiring to be a talented in-home barista yourself you need to operate with good coffee makers at home for a win-win situation for yourself. There are a number of options in the market to help you efficiently brew coffee and one leading name in this is Nespresso. 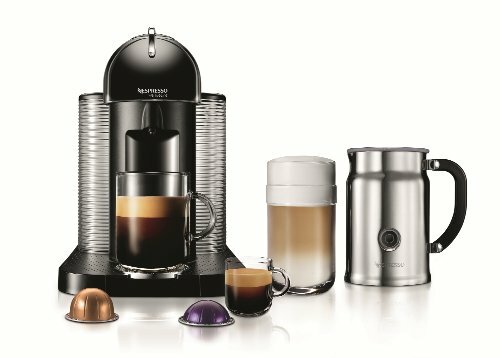 All Nespresso machines use the same range of capsules and basic capsule coffee systems to prepare a yummy cup of coffee for you. To get the best Nespresso machine for you, first think about what kind of coffee you want to make to satisfy your appetite. If you want a swift espresso shot in the mornings then save some cash and look for a coffee machine model that don’t have a milk frothing feature. Take a look at the following Nespresso machine reviews and choose the one that fits your style. In this article we share with you the top 5 nespresso machines that you need to know of if you are an avid coffee drinker and look for a speciality tool for yourself to brew perfect coffee from the comfort of your home. Best Nespresso Machines 2019 – The Winners! This is also one of the most compact Nespresso machines. The modern design is available in three different colors. It takes around 30 seconds to produce a shot of espresso and the milk frother is easy to use to make your cappuccino. The cleaning process is really simple and you can disassemble and assemble the machine with ease. It’s foldable to accommodate a short or even a tall cup of coffee with just a push.The Citiz shuts off automatically after 30 minutes to conserve energy. You may also set your own preferred volume by simply pressing one of the brew buttons down to get the intensity you’d like. It includes an Aerocino plus milk frother which works with one touch preparation to make cold or hot milk froth at your convenience. It comes with easy insertion and ejection capsules and you can hold upto 10 used capsules in it. Furthermore, it comes with a compact brewing unit technology. If the device is inactive for 9 minutes, it automatically powers off. You will also get a cup tray to hold tall recipe glasses with it. While the Nespresso CitiZ is compact, the Pixie is even smaller. It has a bigger water reservoir than Nespresso CitiZ. Thought Pixie has a smaller reservoir as compared to CitiZ, but hass a flashing light which warns you when the water level is low. This is a solid as well as compact espresso machine. This ultra-compact machine brews one perfect cup at a time. Works exclusively with Nespresso’s premium coffee capsules for locked-in freshness and convenience with no mess. Brewing is fully automatic – simply pop in a coffee capsule & select your cup size. It comes with programmable buttons for brewing espresso. You can also enjoy the benefit of a foldable drip tray for larger cups and complicated brewing recipes. There are backlight indicators in it to detect the water level and auto power off. This nespresso machine also comes with an easy to use power cord storage. You can keep the used capsules in a container that comes with the coffee maker. At one time you can use 24 ounce of water in the tank. The Nespresso Inissia is the most affordable Nespresso machine. It can hold 11 capsules easily. 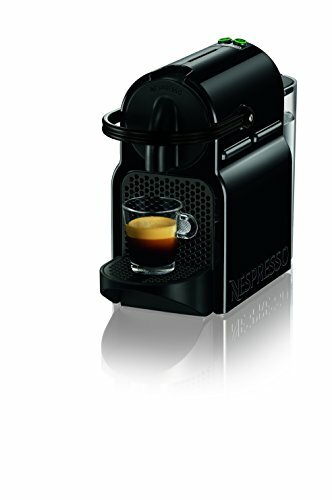 In order to get the smaller price tag, Nespresso created this machine with economical parts. The bulk of its components are made from plastic, as opposed to stainless steel or aluminum. Inissia is the cheapest Nespresso machine and is a great choice for those on a budget that simply want to give this whole home espresso thing a try. Inissia comes in a vibrant color palette to suit all tastes. With is compact size, it can be fitted in any home settings, from kitchen or living room to guest room. Inissia neither compromises quality nor functionality. It heats up in just 25 seconds. This nespresso machine comes with easy insertion and ejection capsules. It is a compact brewing unit technology that comes with 2 programmable buttons for preparing espresso and lungo. You can use upto 24 ounce of water in the tank at one time. It further, energy efficient and automatically turns the power off if you have not been using it for more than 7 minutes. For something a bit different, there is Nespresso Vertuoline. This is actually the combination of an espresso machine and normal coffee maker in one. Vertuoline will let you taste both simple coffee or an espresso coffee, appetizing your taste buds. Vertuoline uses two different sized capsules to recognize the type of coffee you are preparing. The espresso capsules are smaller in size. There are 12 different capsules to choose from. There is also a decaffeinated capsule and even a half-café option. Operating this machine is as simple as operating single serve coffee maker. It comes with an Aeroccino Plus milk frother which has a rapid one touch preparation method for making both hot and cold froth at your convenience. It further gives you the comfort of centrifusion technology for gently brewing both coffee and espresso at the touch of a single button. It comes with two capsule sizes: one is a larger one for making coffee and the other is the size of an espresso shot glass. You comfortably insert and eject capsules from it. You can use upto 13-20 used capsules which are also removable. 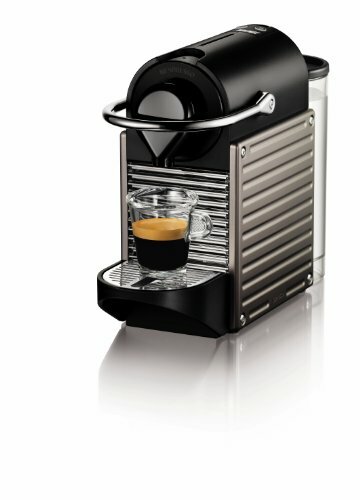 This is a sleek Nespresso DeLonghi U Milk machine that can brew in just 25 seconds and has a water tank that’s movable. It has an incorporated Aeroccino Plus hot and cold milk frother to make lattes and cappuccinos. It has a soft-touch interface that has three pre-programmed cup sizes and an adjustable magnetic cup support for each size. It heats water to within 25 seconds to brewing temperature and has an integrated Aeroccino milk frother for fast cappuccinos, lattes and other milky favorites. This machine has indicators to let you know when the water tank is almost empty and when the capsule container is full. This is one of the cleanest coffee machines you can get thanks to clever no-drip technology. You can create espresso with ideal flow of water with this 19 bars of pressure delivery machine. You can select your favourite espresso or coffee at the click of a button using the Nespresso Original capsules. At a single touch, you can make single serve coffee or espresso with the help of the hot milk system. There is also a thermoblock heating system that helps to speed up cold milk in just a few seconds. It is also energy saving as it comes with an auto-off timer that reduces the electricity consumption. Now that you are acquainted with the best nespresso machines in the market, let us help you through the other important information that you need to know before buying a nespresso machine for yourself. Why type of capsule should you buy? There are two types of nespresso pod machines available: original and vertuo. While the original produces short shots in the form of espresso shots, vertuo pod machines can also brew espresso but they are ideally designed for longer coffee mugs. It completely depends on the style of coffee you want to brew. When it comes to the flavour, both the machines are almost the same but what differs is the strength of the coffee and the flavour it has to offer. You can get a number of third party options for the original pod machine but only Nespresso manufactures vertuo capsules. What are the options you should look out for? Vertuo machines can dispense the amount of coffee you want at a single button, simply by reading the volume from the barcode of the capsule. Original nespresso machines have different physical controls. Look for a machine that can deliver either 25 ml shots, 40 ml shots or 150 ml large glasses. Size matters if you are particular about how much space you really want it to take in your kitchen. If the capsules are large and the water tank is large then it will take more space. So this depends entirely on the space you can let it take in your kitchen. All nespresso pods can be recycled. So if you are ordering these capsules you will also get a free recycling bag. You can easily drop it off in the nearby store and collect it with your next delivery. If you are the kinds to opt for lattes or cappuccinos then you will need a machine that can steam milk. Some of the nespresso machines come with Aeroccino milk frother which lets you froth cold or milk at your preference. Though you can buy it separately it is always better to go with the Aeroccino options if steaming milk is a concern for you. 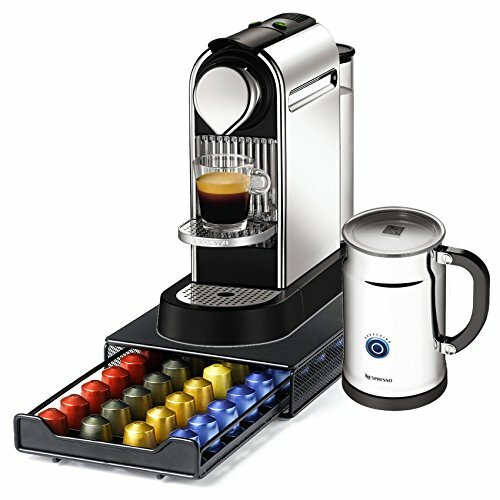 Here, we have listed the best 5 Nespresso coffee machines for you that can prepare coffee according to your needs. Moreover, the machines are sleek and portable too. So, you can definitely eye over these machines and buy any of them to fulfill your coffee needs every day.